Day 303 What kind of clutterer am I? Cindy wrote another great post on Thursday which gave me inspiration to finally write something after this week of craziness. She wrote about the two types of clutter – Let it all hang out clutter and hidden clutter. With those as my choices I think I fall into the hidden clutter category but I’m not convinced there isn’t a third option – The just own two much stuff variety of clutterer. This clutterer has things out there neatly on display and hidden away in every nook and cranny at the same time. They either keep progressively moving into bigger homes to accommodate all this stuff they “just can’t live without” or continuously declutter only to make room for more wasteful substitute clutter. Although maybe we could bring it back to the organized clutterer and the disorganized clutterer. In that case I am definitely the organized clutterer. My mother-in-law would tell you that when my children were little that I would put their toys away while they were still playing with them. That is probably only a slight exaggeration certainly not that far off the mark. If anyone needed something in my home I could tell you exactly where it was at any given time. I could tell you what people had been up to just by where things were lying. Now I am starting to sound like a freak. My daughter had a “secret” party once when we were out of town overnight. I knew something was afoot as soon as I walked into the down stairs toilet because she had emptied the trash bin. Children don’t do chores without being told, at least mine don’t, so I investigated further. To cut a long story short she was grounded for the rest of the school year just because something was out of place. All that being said, there is no hiding due to the fact that this blog exists that clutter can build up no matter how organized you think you are. You only have to look at all the photos of the stuff I have gotten rid of over the year to see proof of that. Some of it was hidden away and some was out neatly in full view but now most of it is either hanging out in the thrift store or being of better use to someone else. I have always been a great organizer and declutterer but now I have learned to “be more with less” and not to be so wasteful and that is the key. 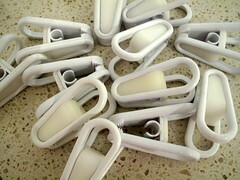 Pegs that fit on plastic coat hangers that I used to hang washing on when I lived in Seattle. I no longer hang washing this way and neither do I have plastic coat hangers so I don’t need these maybe someone else does. A nice cup of tea to sooth frayed nerves. The helpful overworked staff at the hospital. Automatic washing machines – put it in walk away and come back to hang it out when it’s done. My bed – I am looking forward to my head hitting the pillow tonight, I am exhausted. Living in a location that is convenient to anything I need. Hang in there. 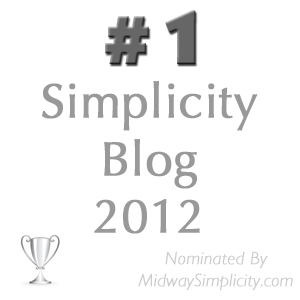 If you need anyone else to guest blog, I’d be glad to write a post for you. Stay strong, mommy. My prayers continue or you and your family. I was directed to this site by Laura and I love it! Keep up the diligent posting and I’ll keep reading! I got out of a $20K rat hole about 15 years ago and never looked back. It was a combination of student loans, a huge vet bill (accidentally rat poisoned both of my dogs), and a living above my means – not a whole lot but every single month. The book Your Money or Your Life was very helpful to me. You Can Do It! I just remembered I also went to a local non-profit that helps people with CC debt. They negotiated some lower interest rates and fixed payments. I paid them a certain amount every month, and they paid my CC bills. When the smallest bill was paid off, the money that had been going toward it went to the next smallest bill, etc. I know there are a lot of “help you with your debt” scams, so be cautious. Hang in Colleen, we’re all with ya baby!! Look after yourself, too, Colleen. It’s easier to say than to do, but it will keep you going longer. I hope that tomorrow (or is that today in Australia?) brings improvement, no matter how small. I have a question for your readers. Does anyone else struggle with what I think of as “time” clutter? – those things like computer use or TV watching which use up the time I should be using to get my house in order. How did you attack this kind of clutter in your life? I use my police voice and tell myself, ” Step away from the computer.” Doesn’t always work though. I like Cindy’s idea. If I am sitting there being useless I stop for a moment and consider how I am feeling about it. If I feel lazy or worthless sitting there I get myself up and force myself to do something more useful. Often once you get started you find yourself on a roll and just keep on doing useful stuff. Thank you C and C for the gentle nudge. there is no need to hang your head in shame so long as you plan on trying to do something about it. We have all been there and will probably go there again at times but so long as we shake it off and get back to it we will be OK.
And remember Jo, just because Colleen and I said how we pry ourselves away from the computer, doesn’t mean it always works – at least not for me!